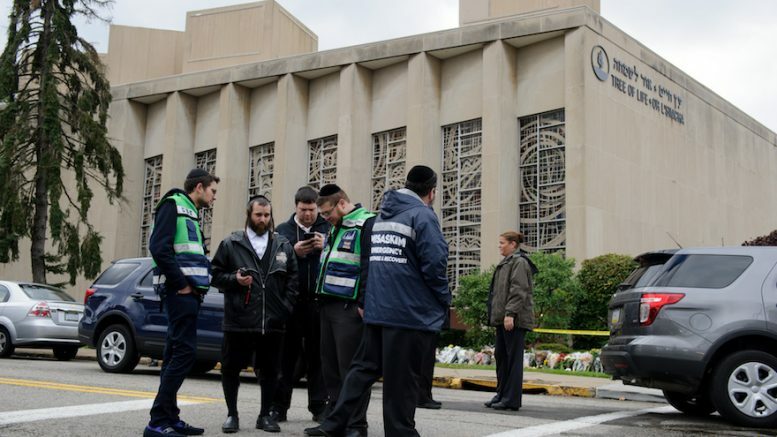 (JTA) — The American Jewish Committee is urging Jews — and non-Jews — to come to synagogue this Shabbat in response to the shooting during services Saturday at Pittsburgh’s Tree of Life Synagogue that killed 11 worshippers. The organization is calling on elected officials, civic leaders and others to join Jews at services as part of the #ShowUpForShabbat campaign. Representatives of AJC’s 22 offices across the United States are reaching out to communal partners and local government officials to ask them to participate in the #ShowUpForShabbat campaign. Simultaneously, the organization’s 11 international offices are working with partners in over 35 Jewish communities around the globe to launch similar initiatives locally. Other local, national, and international Jewish organizations are being asked to encourage their members to participate in the campaign. Synagogues are being called on to welcome the anticipated influx of attendees at their Shabbat services with explanatory programming and rabbis are being asked to dedicate their sermons to discussing the initiative. Social media users are being encouraged to tweet and post about their plans to attend Shabbat services this weekend using the hashtag #ShowUpForShabbat. A range of synagogues, rabbis and Jewish organizations have said they are taking part in the campaign. Be the first to comment on "Campaign asks Jews to attend Shabbat services in response to Pittsburgh shooting"